Many of us are not so lucky to live in a French country home nestled just hours away from Paris, but that doesn’t mean we can’t decorate our interiors with a touch of the French aesthetic if that is indeed what we love. From the simple touches of trays and art, to carefully selected furniture by the way of settees and coffee and side tables, the French style we love can be ours no matter where we call home. As I have been diving into my decor as of late, I am noticing that I am indeed drawn to the French aesthetic. Perhaps more cozy chic French (as I discussed in this post), but a touch of high and low, regal and comfortable is the balance I tend to strive for. And while my budget is in save mode at the moment after having just purchased a new sofa, I couldn’t help but share a few finds as One Kings Lane just made available some exquisite French vintage finds as well as items that would complete the French aesthetic in your home if that is indeed the look you are aiming for. And while the items can be found online, allow this post to be an inspiration for you as you head out to the local flea markets, yard and garage sales as well as estate sales. You never know what you will find, but if you know generally what aesthetic you are looking for, you are more likely to know it when you see it. What the French have is generations of families passing down their best stuff. How many times have I admired something at a friend’s house, to find out it came from a grandmother or aunt, who got it from an aunt or grandmother…. Not being French myself, I managed to buy the contents of such a family home. The quality of the pieces is beyond anything you find today in stores. Yet, plenty of younger people prefer modern to antiques. Our home is a mix, with eclectic items like hand-carved chairs from Lamu. Like Bunny says: if you love it, it works. Genuine antiques are always in style, and adding a few modern touches to bring things up to date works perfectly for us in our old French home. I also love the history that goes with so many bits of old furniture. We have a long case clock that has been in the family since it was purchased in 1780. Inside the door someone wrote every time it was serviced or repaired! I hope it will never leave our family. I love a mixture of Britsh and French antiques best. This is such perfect timing! 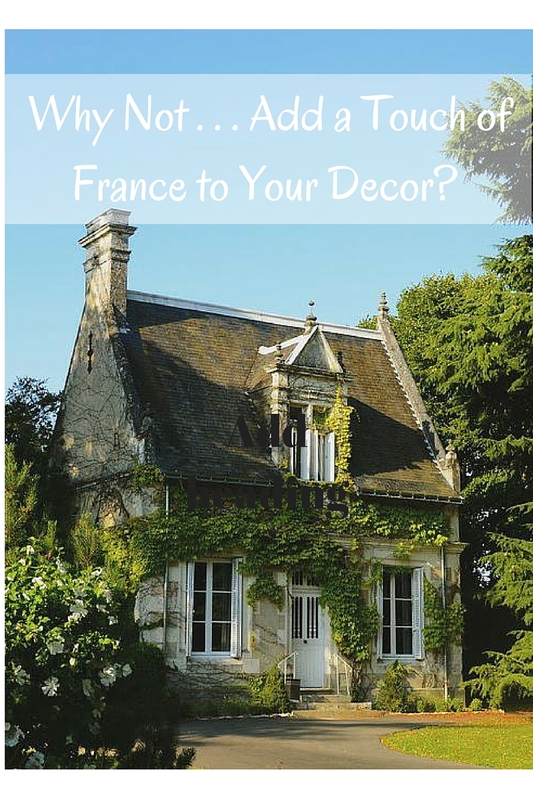 Having just repainted our master bedroom in a beautiful shade of grey, I’m looking to decorate with a French theme. Thank you for the guidance. What image are you referring to? Thank you so much for this post Shannon! It’s like a breeze of fresh air! I love all your finds from One Kings Lane! Love the brass coffeee table, Im finding that brass furniture is becoming a lot more popular along with copper and mirrored furniture.